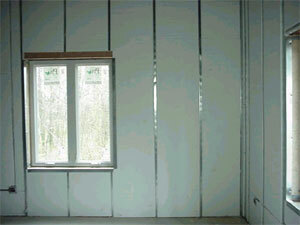 Out of sight, inside the building, things are really moving. 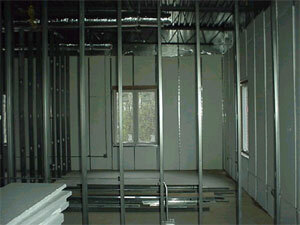 Below on the first floor you can see the frames for the new room with the ductwork, electric, and insulation. 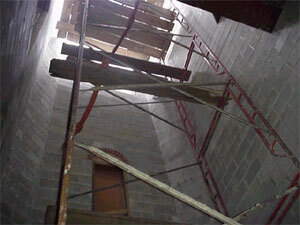 We also have a unique view looking up into the bell tower before the stairs have been placed. 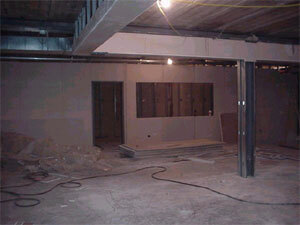 Here we see the work going on in the basement. 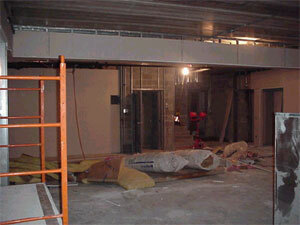 The dry wall is being placed. 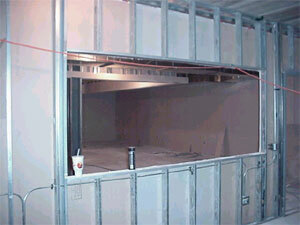 The kitchen area has been defined with a window cut into the drywall. 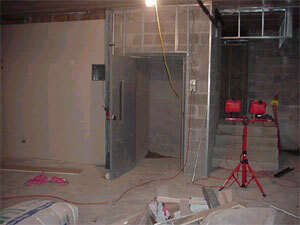 Also we can see the entrance for the lift from the first floor. 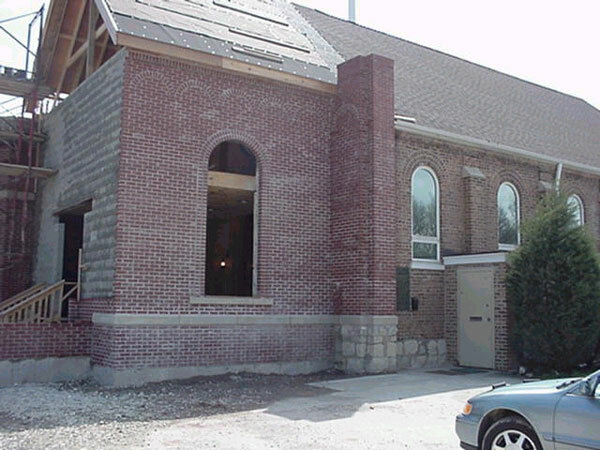 As has been our custom for several years, St. Luke and Sts. 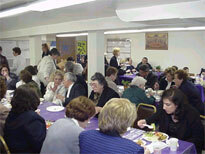 Constantine and Helen Parishes take turns visiting each other for Presantified Liturgy. Although it was a rainy night many parishioners from Sts. Constantine and Helen turned out to share the service with us. 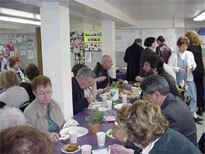 Following the Liturgy, everyone was invited to attend a lenten supper in the fellowship hall. The food was great and well as the company. 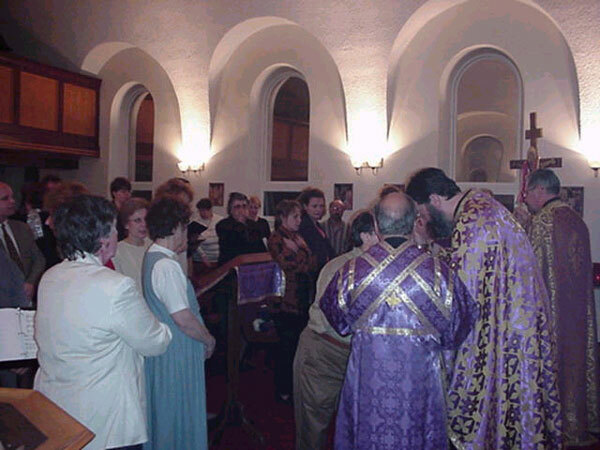 We once again thank Sts Constantine and Helen for their support, prayers, and fellowship. 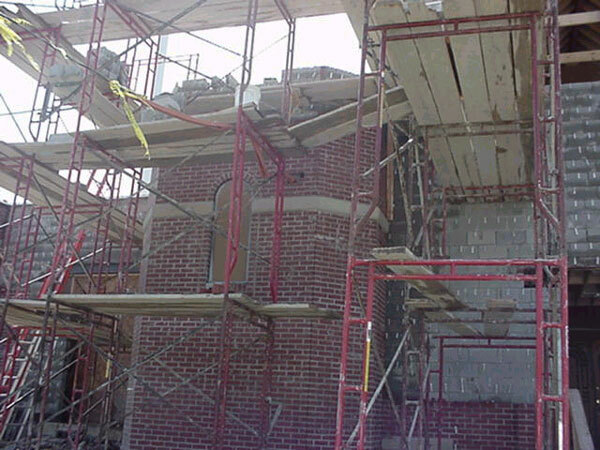 With the brickwork completed on the back and sides on the building, work is progress on the front and the bell tower. Unseen at this time is what's going on inside. 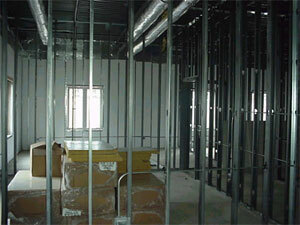 Ductwork, plumbimg, and the forms for the rooms are being set. 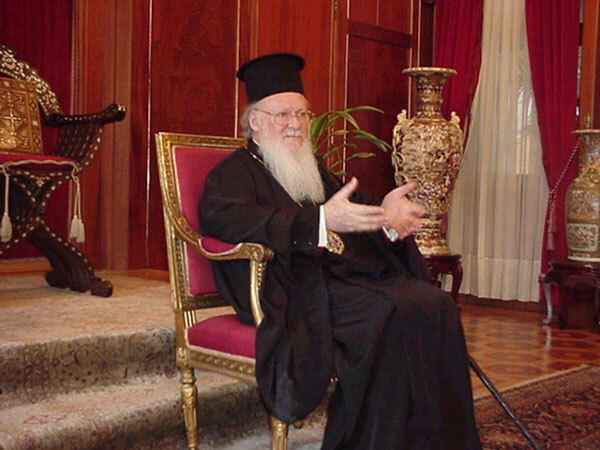 His All Holiness the Ecumenical Patriarch presented a cross to Fr. Andrew at his international office in Istanbul. Fr. 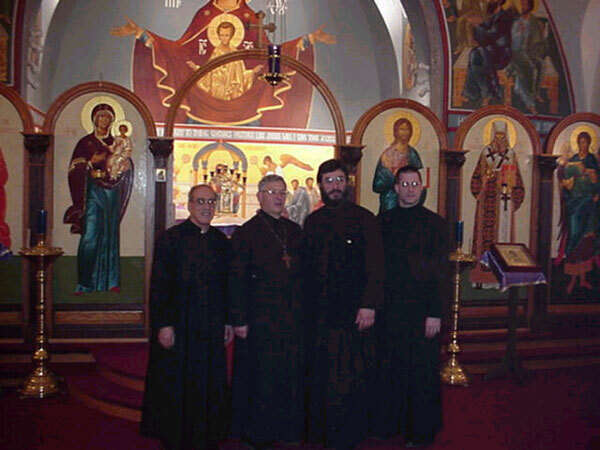 Andrew was a member of a delegation of American clergy visiting the Christian sights of Turkey and Greece for the purpose of organizing pilgrimages. Fr. 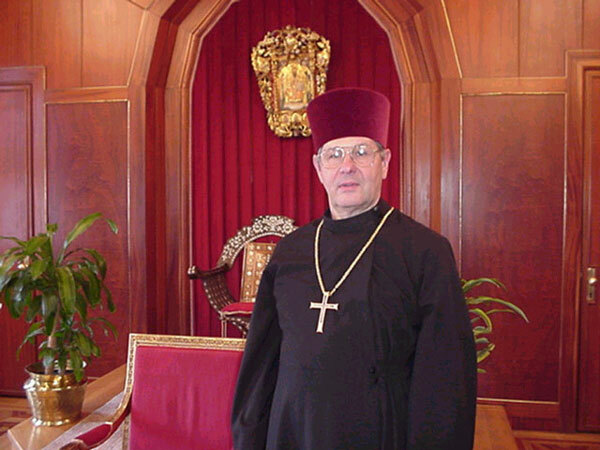 Demetri Kantzavelos Chancellor of the Chicago Greek Orthodox Diocese, also a member of the delegation, introduced the delegation to Patriarch Bartholomew. 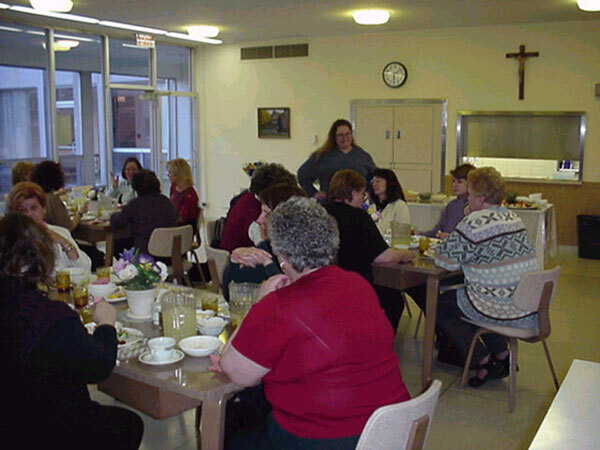 Without counting, and thinking I’m remembering Father Harrison mention the number 19 at Divine Liturgy, I’ll begin by saying that 19 women convened at the Loretto Center in Wheaton for what this writer considered a wonderful annual retreat. 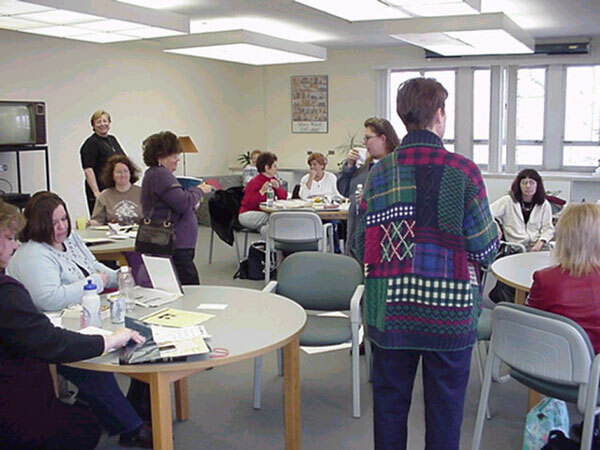 The Loretto Center is on 14 acres of beautiful quiet, serene land founded by and supported in part by the Institute of the Blessed Virgin Mary. The topic of our discussions The Fruits of The Holy Spirit was very aptly headed by our esteemed speaker Ms. Kay Valone. Ms. Valone was a public school teacher for 36 years and has an amazing knowledge of the Bible, not to mention a passion for interpreting it which I and many others found inspiring. After discussions the women broke out into small groups to further discuss how The Fruits of The Holy Spirit affected each of us in our lives and then we reported our findings back to the entire group for further discussions. Father Harrison was present to hear confessions and to say Evening Vespers which were followed by a delicious fish dinner. It was noted that maybe the men should have a retreat, as Father said, the women are up by 2; that should encourage healthy interest! The Fruits of The Holy Spirit are: Love, Joy, Peace, Patience, Kindness, Goodness, Long-suffering, Mildness, Fidelity, Modesty, Continence and Chastity. Try to balance your spiritual diet with generous servings of all The Fruits daily. 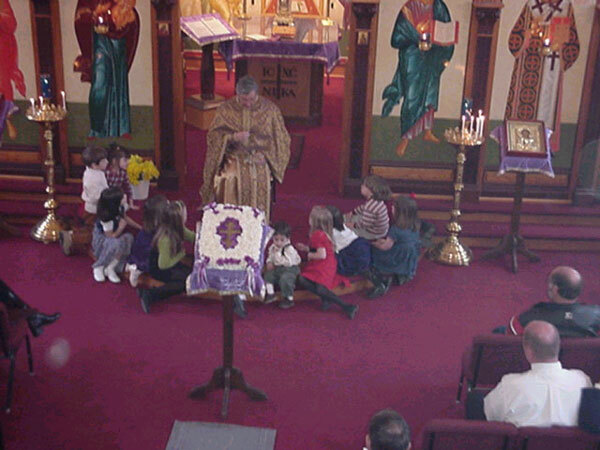 From time to time, Father Harrison forgoes his regular sermon and instead gathers the children to him for their own special sermon. On the Sunday Of The Cross, he explained to the how to make the Sign Of The Cross and what it meant. Our children are our future and it is wonderful that he gives this special time to them. While these sermons are geared to the children, often our adults find them entertaining and informative as well.